Bill will be signing each copy sold from the online store. 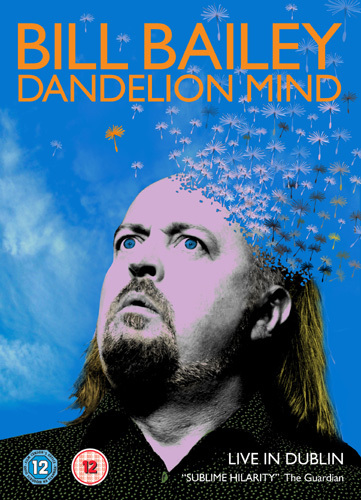 Filmed at The O2 in Dublin in October 2010 and featuring Bill’s trademark musical interludes, observations and stories of the road, Dandelion Mind is based loosely on the theme of doubt (or will it? ), as we follow Bill from his real-life saga of being trapped by the ash cloud, to his barely contained rants about celebrity, TV, creationism and Michael Winner. He demonstrates new instruments, both ancient and modern, he sings an internet love song, a lament about punk heroes, Iranian hip-hop, and plays a mean folk-bouzouki. Thomas the Doubter gets a new look, and Darwin’s curious obsessions and the myth of intelligent design are all worked over in Bailey’s own surreal style. He revisits the music of his youth, with a brand-new French Disco re-working of Gary Numan’s hit, Cars, played in his own inimitable way, and maybe some Wurzels-based remixes of classic German techno. Just your normal Bill Bailey gig, then. Categories: Audio visual, Sale, View All.